I've been following Fresh Lemons' blog for a while now, and she never fails to inspire or impress. Now, for some reason I get a mind block when it comes to paper/foundation piecing... Don't ask me why, maybe it's the fear of wasting fabric, or just working backwards. 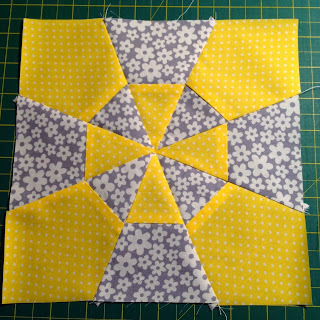 However, when I came across Faith's Lighthouse Quilt A Long, I thought I'd have a go, and this is my first block. It was very easy, though each piece only has one seam! But the over all affect when you sew all the blocks together is so beautiful, I can't wait to make more. Well, I've completed one block, just a few more to go!